Patients with life-threatening food allergies have traveled to the National Allergy Center in California from as far away as Abu Dhabi in the hopes that they will return home able to enjoy nuts, eggs and wheat. About eight percent of American children have at least one food allergy – and the autoimmune response is only getting more and more common. The safest bet has long been to simply avoid any allergenic foods, but that may mean that going out to eat is always a little scary, involves a long list of questions and restriction, and is best served with an Epipen handy. A handful of allergists and immunologists are experimenting with doing away with allergies by a kind of exposure therapy. So far, most studies have shown that the treatment is promising, and a number of clinics are opening up across the US. 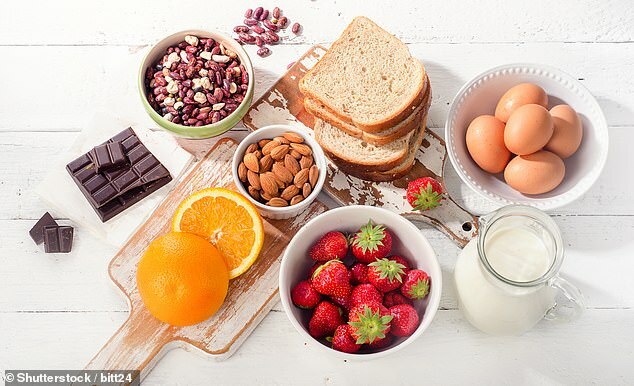 The protocol works out what foods a patient is allergic to, and how sensitive they are to these, then starts them on tiny daily doses of those foods, as well as an allergy blocking shot, in some cases, slowly building up a patient’s tolerance. But if it doesn’t go right, patients might find themselves in life-threatening anaphylactic shock. That was Kate Rome’s greatest fear when she started to take her daughter, Haley, now 12, to the National Allergy Center (NAC) to treat her severe peanut allergy about a year-and-a-half ago. ‘Oh, I was terrified,’ Kate says. Haley has managed to stay out of the ER for most of her life, but when she was four, her family discovered her allergy because she went into anaphylactic shock for the first time, and it has haunted Kate every since. Allergies are essentially an immunological glitch. The body recognizes non-threats – like peanuts or gluten, or eggs – as threats or invaders that need to be expelled. So the immune system ramps up production of antibodies against whatever trigger it has detected, causing symptoms like runny nose, sneezing, itching, red eyes and hives. But the immune system’s attempts to attack these ‘invaders’ are misguided and the chemicals involved in combating them can throw the body into shock, constricting airways, and driving swelling in the throat and mouth, as well as rapid drops in blood pressure. All of this can add up to anaphylactic shock, which cuts off breathing and accounts of three in every 1,0000 admissions to to children’s ICUs, according to Food Allergy Research and Education. A shot of the hormone epinephrine can kick everything back into gear, but a trip to the hospital is still necessary, and expensive. Many allergies, such as those to eggs, tend to disappear with time, often fading away entirely by the time someone is in their 20s. But there’s no guarantee of this disappearing act. We don’t know for certain what causes some people to develop allergies, but some research indicates it is mostly genetic, while another theory suggests that the immune system doesn’t recognize new foods because people aren’t exposed to them early enough. Based in part on that concept, scientists are experiencing with oral immunotherapy, or OIT – a technical term for trying gradually more of the offending foods as a way of retraining the immune system to recognize them as okay to eat. OIT 101 lists some 60 clinics across the US offering the experimental protocol, and leading the way is the California-based National Allergy Center, founded in 2017 by Whitney Block, which now has locations in Redwood and a newly-opened one in Burbank. Patients there follow three steps of a protocol. First, doctors confirm what foods they are tolerant, sensitive (meaning they have a mild reaction) and allergic to. Based on these, they come up with a starting dosage and incremental increases to each food a child or adult is sensitive or allergic to. Block has been studying OIT for food allergies for years, based out of Stanford University. So far, OIT has shown a lot of promise for treating egg and peanut allergies. When researchers gave 47 patients boiled peanut immunotherapy, 24 of them at least became desensitized to the the nuts, and even after a four month break from the ‘therapy,’ all of them were able to eat at least two peanuts without problems. The training process was surprisingly not disruptive to the subjects’ – aged eight through 17 – stomachs, but there were some scares. On 19 occasions, 10 patients went into anaphylactic shock. Four patients dropped out because the treatment wasn’t sitting well with them (either due to anaphylactic shock or another treatment side effect, and another four dropped out for other reasons, according to a study published last week (and funded in part by a peanut company). The research group is one of several bidding for Food and Drug Administration (FDA) approval for peanut immunotherapy. So the good news is that OIT seems to work – but when it doesn’t the treatment is life-threatening. This may give the FDA pause, but clinics like NAC aren’t waiting around, and have already treated scores of patients. Block saw the safety and success of OIT and decided to strike out on her own. At NAC, patients decide what their goal is – to be able to be in the same room as a trigger foods, accidentally eat a small amount of it without mortal fear or to be able to actually eat and enjoy the foods they’ve never been able to. And they really want to. Block says she’s treated hundreds of patients, coming from her local area, from cities like Boston, and even one who flew from Abu Dhabi to California three times in six weeks for food challenges – trying the trigger foods out to see if the daily conditioning doses had desensitized them. Starting the desensitization process and especially dong the food challenges feel unnatural and scary, patients agree, but it’s worth it. ‘It’s the opposite of what you’ve spent your energy trying to do – keep peanuts [or other allergens] out of your child – and now you’re putting peanuts into your child,’ Kate said, admitting she was more nervous than her daughter, Haley. Christine Polek brought her son, Wyatt Harris, now 15, to the clinic from Boston every few weeks. It was an enormously expensive endeavor, even though Block says insurance generally covers the cost of treatment itself. For Wyatt, starting the treatment, in part because it involved flying cross-country, was ‘kind of a big investment and n adventure, so he was excited,’ Christine says. But less so about the food challenge. ‘When they had to test how much milk he could tolerate, he was very, very scared after so many of his life [spent with milk as a life and death situation,’ Christine says. Both Wyatt and Haley’s allergies have improved dramatically. Wyatt and Haley are both still on ‘maintenance’ doses – small amounts of foods they’re allergic to on daily or every other day schedules, respectively. That means eating something made with the equivalent of three cups of milk, Goldfish crackers for Wyatt, or a two Peanut M&Ms with a bowl of ice cream for Haley every other day – doctor’s orders, ‘because it helps her tummy metabolize the peanuts and it’s required by Whitney,’ Kate says. ‘Yeah, it’s really torture these kids go through,’ Whitney laughs back. OIT is too new to tell if it will ever mean these kids can eat whatever they want whenever they want, but their mothers have no doubt it’s changed their lives.